A great gift for the recent retiree or the serious gardener. Give a flower to that special someone in your life. Makes a wonderful Thank You gift! 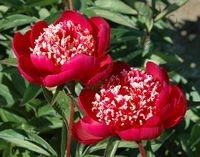 Remember a special birthday with peonies! Celebrate with a gift that will bloom for years to come! A generous gift for a precious person! 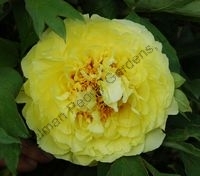 They will remember you every year when their peonies bloom! Red, japanese, midseason, slightly fragrant, 30" tall, lactiflora. Glossy and lustrous foliage. Center petaloids edged with gold/white.